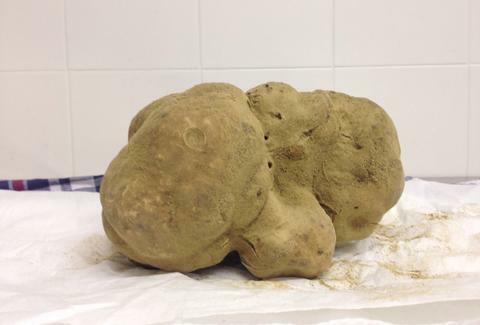 The biggest truffle on the planet turned out to be a relative bargain. We told you last week about the world's largest white truffle -- discovered in central Italy and weighing 4.16lbs -- and the pre-auction hype that said offers as high as a million dollars had already come in from mystery buyers in China. Well, according to Grub Street, which sent an intrepid reporter to the auction, the giant tuber sold for a measly $50,000 (plus a 22.5% buyer's premium that brought the final price to $61,250), with some of the profits benefitting Citymeals-on-Wheels and the Children's Glaucoma Foundation. The group of 25 prospective buyers broke into "thunderous applause" when the truffle was unveiled, with attendees jumping to take photos as the prized truffle's odor filled the room. "I wish I could take a picture of the smell," one bidder said, which is actually a million-dollar thought. The bidding started at $40,000 and was over within three minutes. Sotheby's could only disclose that the buyer (who bid over the phone) was in Taiwan, but whoever they are, they must be beaming that they were able to score the 4lb fungus for $938,750 less than what it was definitely worth. Pete Dombrosky is an Editorial Assistant at Thrillist and he wouldn't have bought that Corvette last weekend if he knew he coulda got 4lbs of fungus for the same price. Commiserate with him on Twitter.